Co. Monaghan: Clones (3), Currin (2), Newbliss (2), St Tierney (2). Co. Monaghan & Co. Fermanagh: Drumully (2). Co. Fermanagh: Aghadrumsee (2), Newtown Butler (3), Rosslea (2). The Board also included 6 ex-officio Guardians, making a total of 24. The Guardians met each week on Thursday. The population falling within the Union at the 1831 census had been 36,569 with divisions ranging in size from Currin (population 3,438) to Clones itself (6,822). 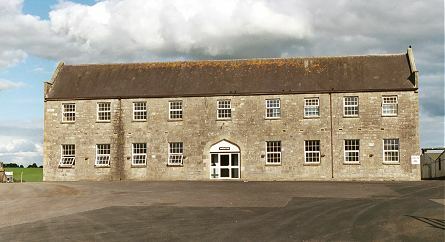 The new Clones Union workhouse was erected on a six-acre site at the south of Clones. Designed by the Poor Law Commissioners' architect George Wilkinson, the building was based on one of his standard plans to accommodate 600 inmates. Its construction cost £5,750 plus £1,207 for fittings etc. The workhouse was declared fit for the reception of paupers on 15th November 1842 and admitted its first inmates on 23rd February 1843. During the famine in the mid-1840s, houses were hired to accommodate an additional 220 inmates. A fever hospital was erected at the north of the infirmary block. Clones Fever Hospital site from the west, 2003. In 1895, Clones was visited by a "commission" from the British Medical Journal investigating conditions in Irish workhouse infirmaries. Their report listed a number of deficiencies including poor sanitary facilities and a complete absence of running water. Nursing during the day was performed by one untrained nurse, assisted by "ignorant and indifferent" paupers, and was non-existent at night. It was also observed that that the workhouse had a Turkish bath, although this was no longer in use. Further details are available in the full report. At the 1901 census, the population of the Union was 15,848 with 8 officials and 80 inmates in the workhouse. The Clones workhouse, together with the other three in the county, was closed on 1 April 1921. The only part of the buildings to survive was the fever hospital which continued in use until 1966. It subsequently became a veterinary unit for a meat processing company.